Unlike yesterday the weather was top notch; it was sunny and warm. No suprise that the castle grounds were already crowded in the morning. 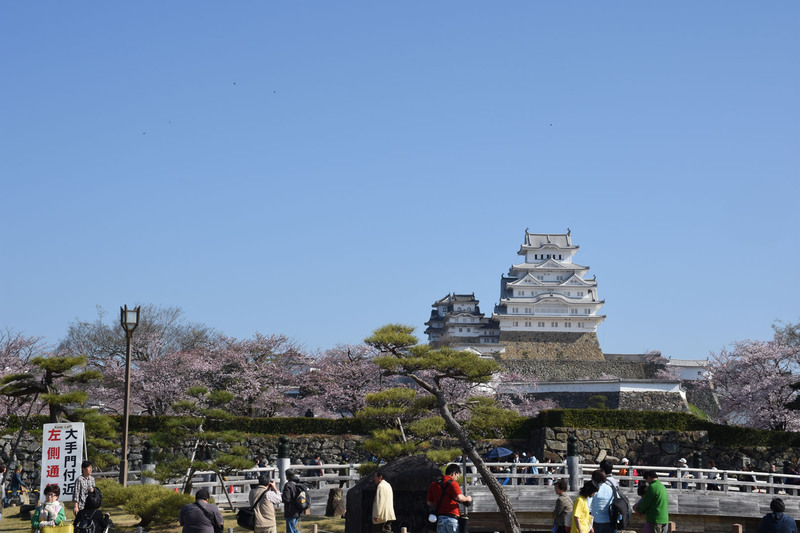 The castle is Himeji’s most renowned attraction, but certainly not its only one. The castle was renovated for many years, but the work has finally been completed. Unlike in 2012, I could finally see the castle in its whole beauty. 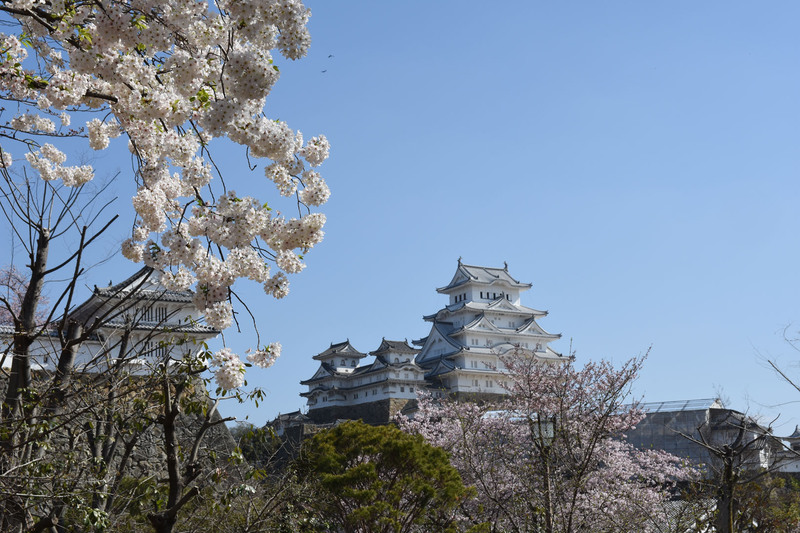 The castle grounds are among the best Sakura spots in whole Japan, I think. 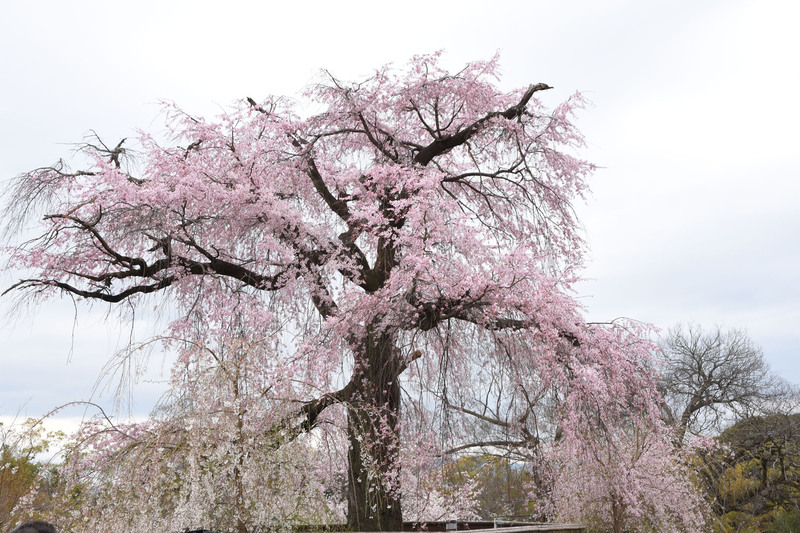 Seeing the blossoms in full bloom made me very happy. Many stalls invited for a quick bite and photography agencies took photos of traditional dressed visitors. The queue leading up to the castle itself was considerably long, but since I did not intend to go inside again this time, I used the time to enjoy the park instead. 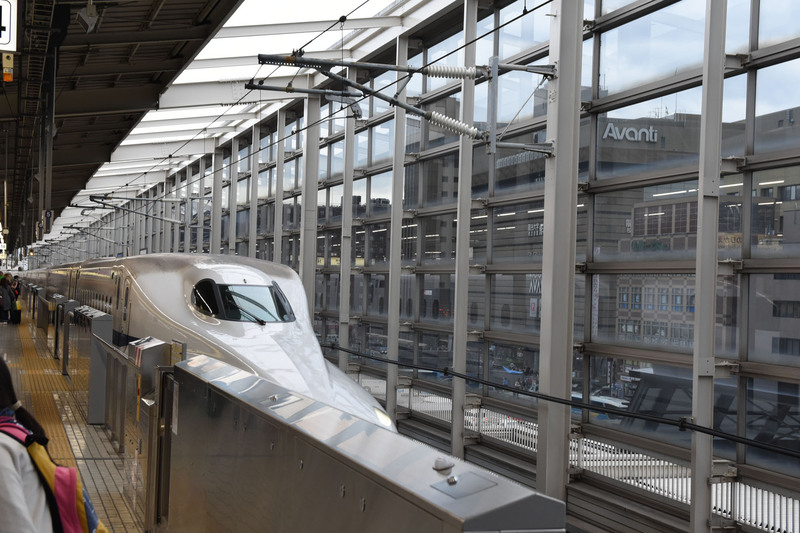 At Himeji station I eagerly awaited the arrival of the Kodama Shinkansen. Usually one would not be that excited for the slowest amongst the fastest trains, but this particular one was an exception. 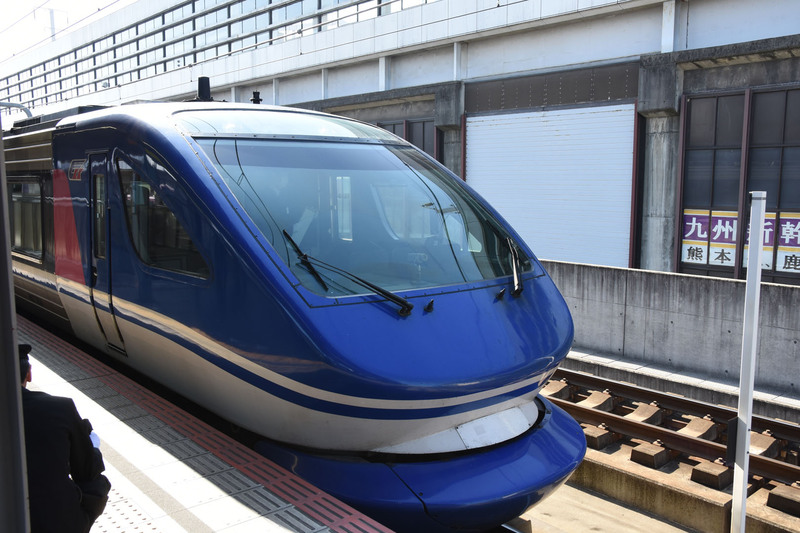 The train was remodeled to resemble EVA Unit 01 from the classic anime masterpiece Evangelion. For one more year the promotional train is on the rails and runs twice per day. Please check the precise schedule beforehand as it does not run every day. Not only the exterior, but also the interior of the first three cars were redesigned. The second car contains purple seats, various installments, and signs of the fictional organization NERV. The highlight is certainly the first car in which an exhibition as well as an interactive piloting simulator is located! Unfortunately, a ticket needs to be purchased in advance to use it. The Kodama service terminated in Osaka, so I switched to a non-Shinkansen train bound for Kyoto. Soon after I arrived at the busy station. From there it got worse and worse. 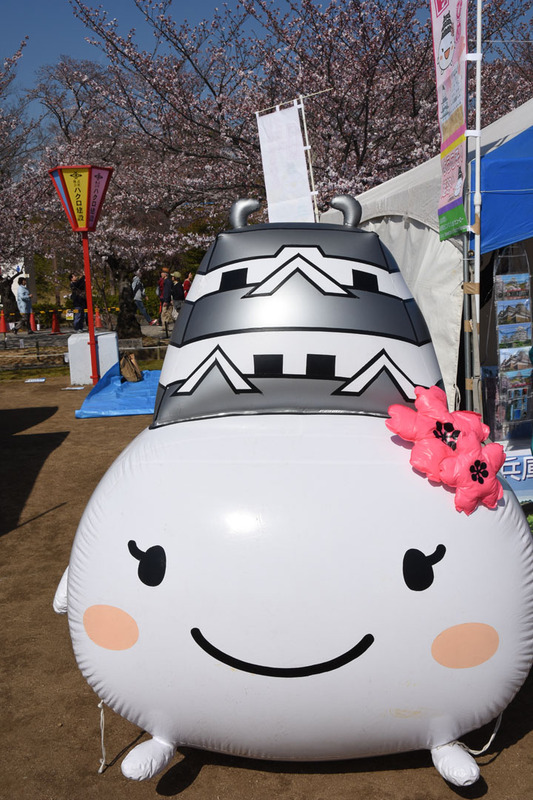 To make it brief, I became very unhappy because I missed the Miyako Odori event. Many different factors contributed to my delay, partly my own, partly traffic congestion and crowdedness. Even though I planned much time for the way, I did not prepare for the immense crowd of tourists. Even compared to my visits in summer it was a different scale. Riding the buses was unpleasant, and in a narrow street a taxi grazed the bus and slightly damaged it. That way I lost much time and even worse, took the wrong bus afterwards. All taken together I could not make it in time. In such situations the Japanese resort to their saying shouganai, it can’t be helped. Instead of grieving one should move on and enjoy the rest of the day. 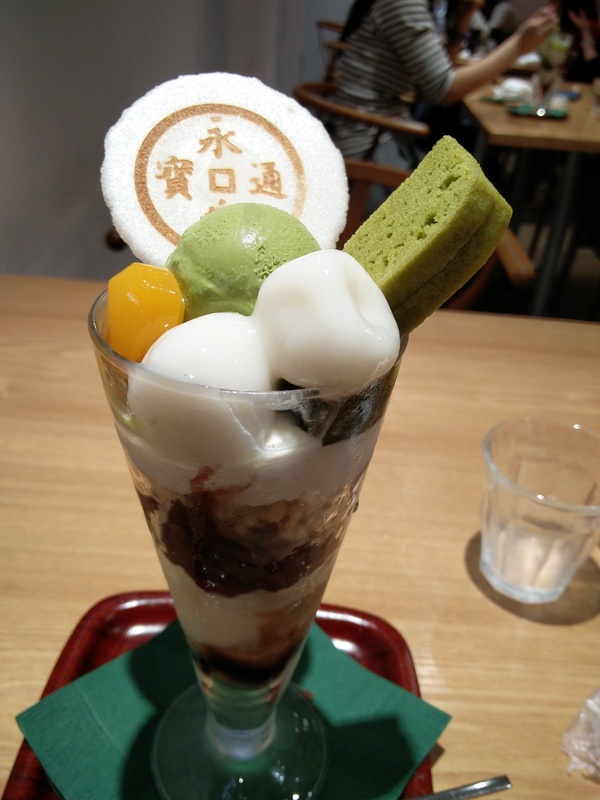 Doing so I went to a cafe to drown my worries in a Matcha parfait. 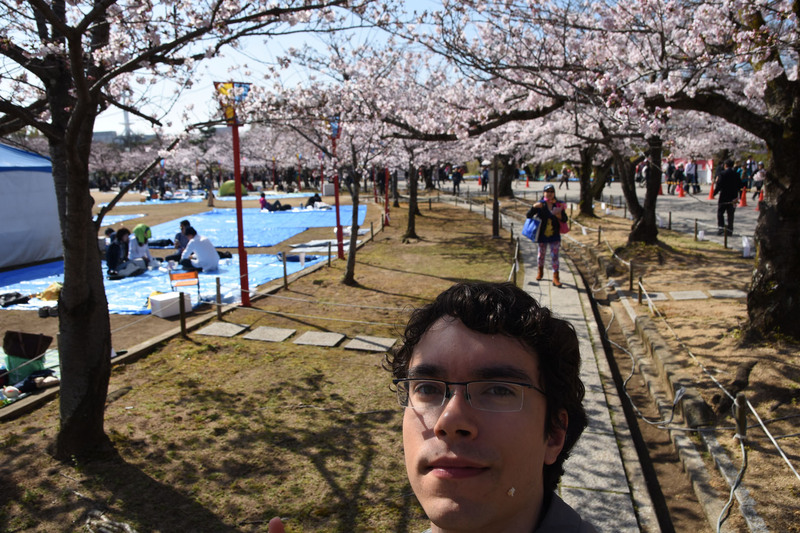 By that time I was in the Shijo / Gion district, that’s why I wanted to see Yasaka shrine next and the surrounding Maruyama Park next. 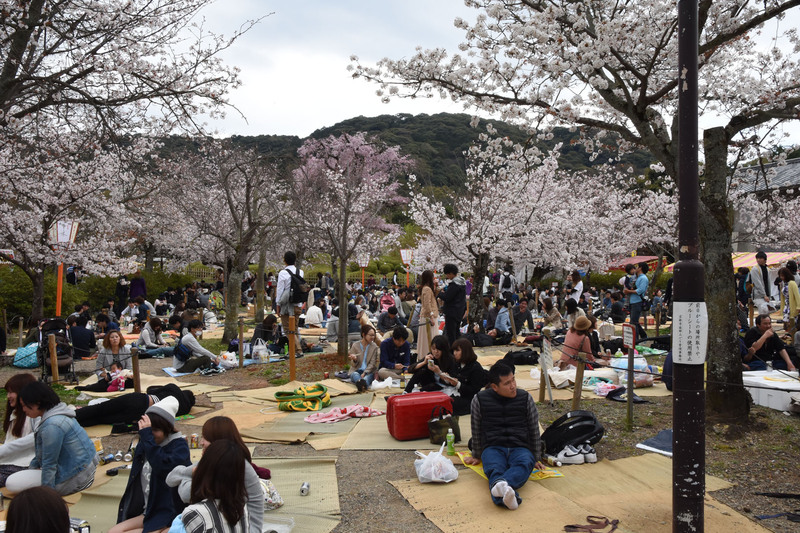 In the park were many cherry trees lined up, and large amounts of people enjoyed themselves during a hanamikai. 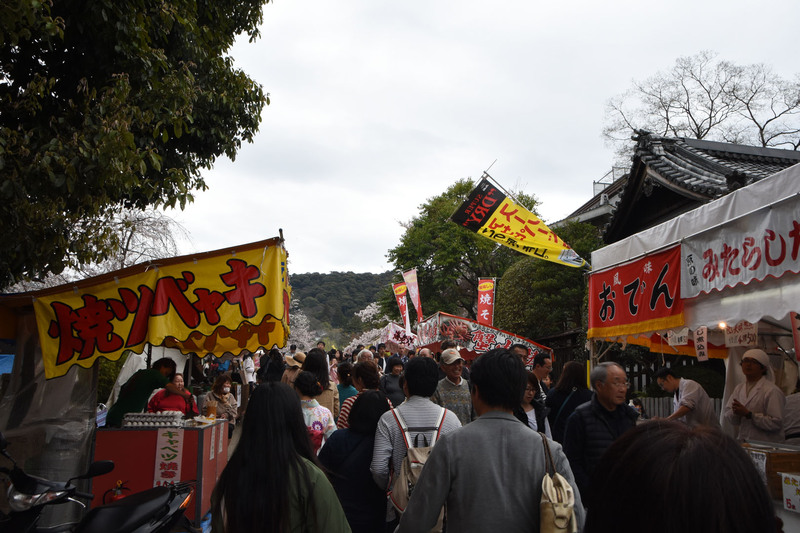 From Yasaka shrine Kiyomizu shrine can be reached by following a road up the hill. The way was so full with people that I could hardly proceed. Finally I reached the intersection leading up to the shrine premises. From there even more people filled the streets. Around 4 o’clock I gave up and returned to the station. 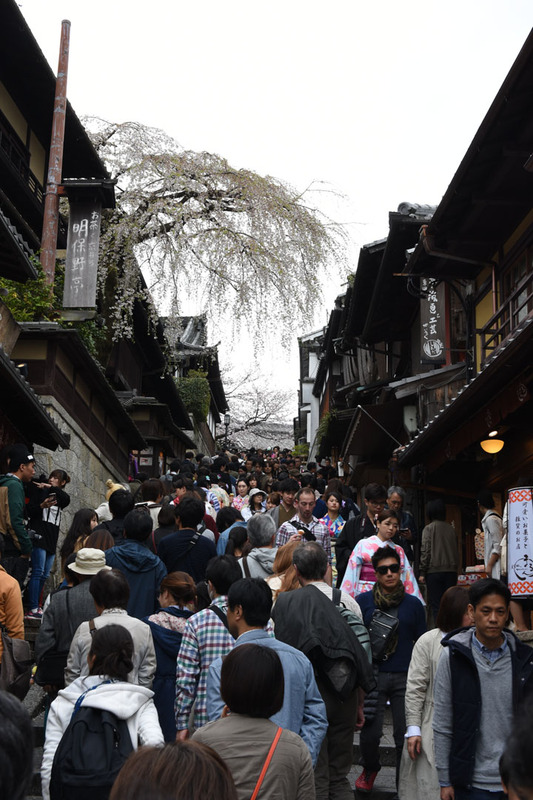 I also skipped visiting the Philosopher’s Path and other sights in the Higashiyama area. The way down the crowded street and in the packed bus was not very pleasant either. In the Shinkansen I could finally feel more relaxed. Luckily I knew Kyoto well from previous visits, so I was not very unhappy about not having seen much. 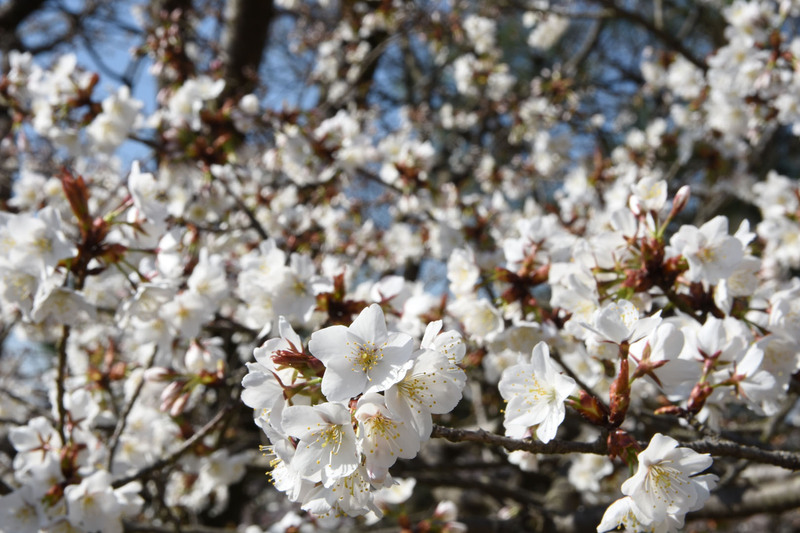 From that experience I recommend to take the popularity of Kyoto during high season into account, and prepare much time. Back in Kobe I treated myself to the iconic Kobe Beef. The last time I had it was four years ago, so it was a good opportunity to refresh that memory. 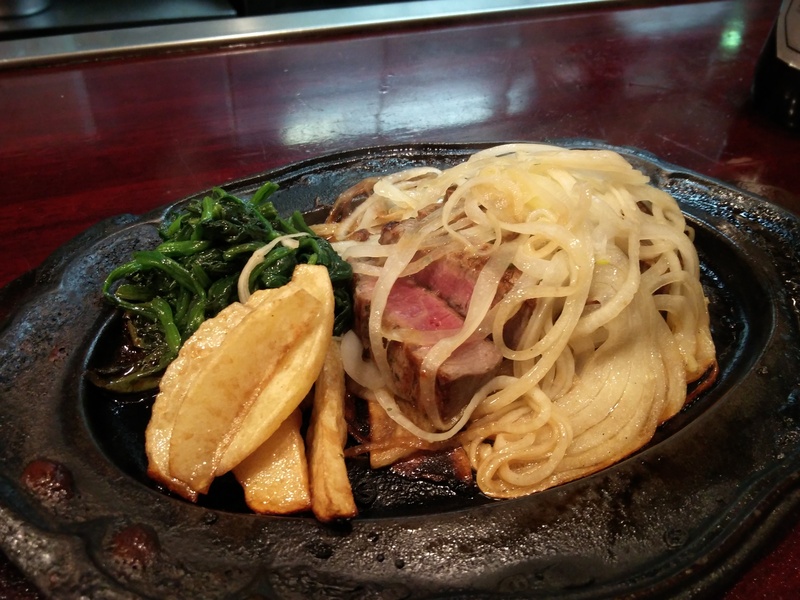 The restaurant I chose was called A-1 and is located next to the Ikuta Shrine in Sannomiya. The atmosphere was not touristy at all, but it seemed that locals come to dine here. 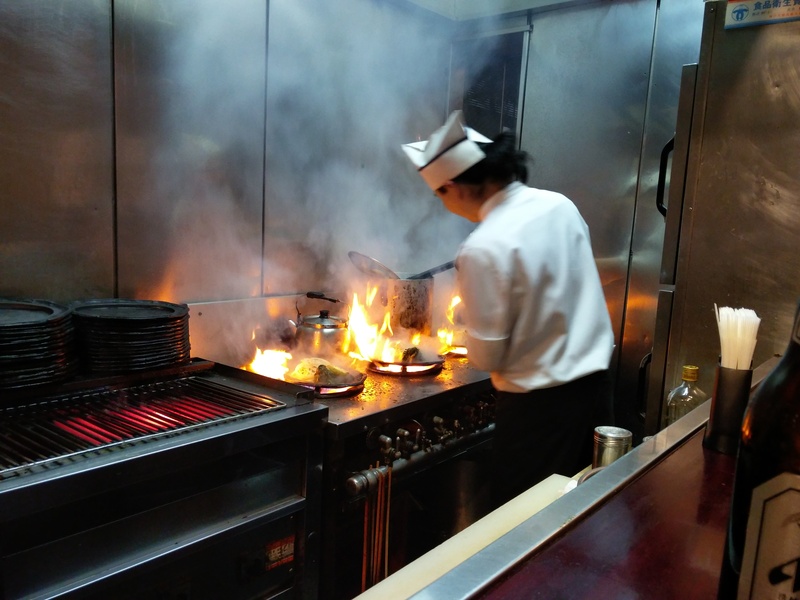 Two chefs prepared an impressive course menu consisting of 240 g of Kobe Beef steak. 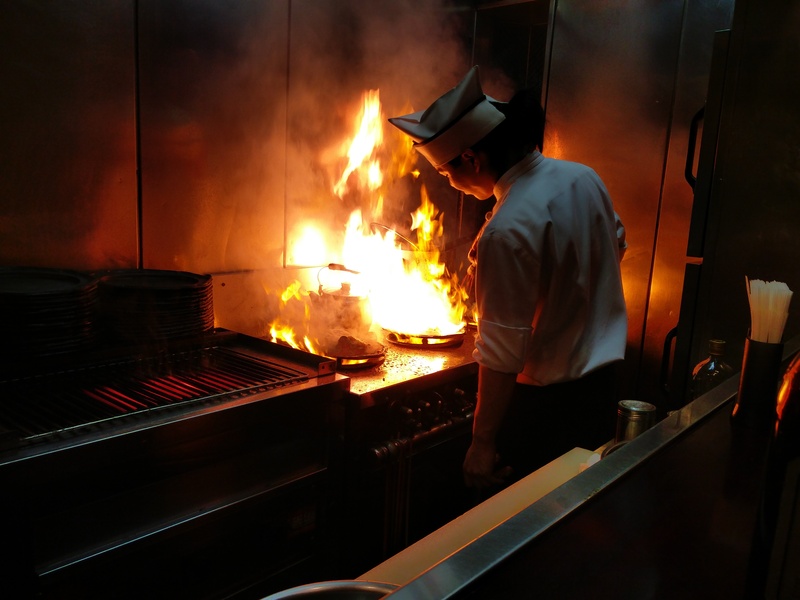 The meat was poured with alcohol and was flambeed for seconds before serving. The tender meat had much umami and paired well to the complimentary glass of red wine. Soon I have to leave Kobe again, the last day in Tokyo and Kawasaki has finally come.